This lovely independent house sits at the end of a small, quiet residential street on the northern end of Trastevere and below the Gianicolo HIll. Dating back to the mid 1600's it was built as artists studios, then in the early 20th century it became a candle factory and supplier to the Vatican. The current owners purchased it in the 80's and converted it to their home to raise their family. Now that they are empty-nesters, you have a unique opportunity to experience Rome as a native among other Romans. 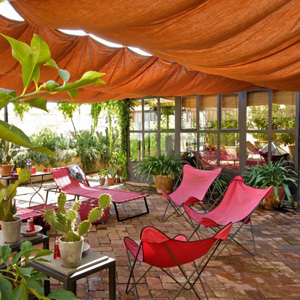 The apartment is spacious, with an impressive 2700 square foot wrap around terrace, you can relax al fresco among lots of potted Mediterranean plants, and enjoy the fresh air and unusual quietness you'd not expect to find in Rome. Inside you have a living room with large glass walls bringing the outside in with lots of natural light. The kitchen is roomy yet cozy, with a farm table for quick morning breakfast or dine out on the smaller terrace reached from the kitchen door. There's also an adjacent dining room that seats up to 8 comfortably. or the adjacent dining room. You are also close to the Gianicolo ( Janiculum) hill. While not one of the famous Seven Hills of Rome, it affords you one of the best views of the city. We always include a stop here on our Orientation tour of Rome because Rome is laid out before you with all its iconic buildings and the Pincio gardens of the Villa Borghese to the Colosseum. The panorama will take your breath away, its thrilling during the day and magical at night. For children, head to the open air puppet theater on the weekends, theu features the Neapolitan hand puppet Pulcinella. I still remember my parents taking me for the first time when I was a child, it's sure to make a memory for your children as well. You will find the Gianicola remarkably quiet, except for a single cannon shot each day at noon, a tradition dating back to the 19th century.